My son, Nehal, is extremely fond of mushrooms. I usually make a restaurant style appetizer mushroom dish for him. 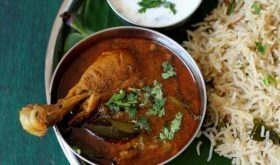 One of his favorite restaurant dish is mushroom pepper fry. 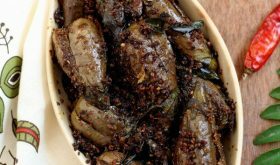 The earthy flavor of the mushrooms pairs beautifully with the sweet green peppers while black pepper adds a hint of spice. 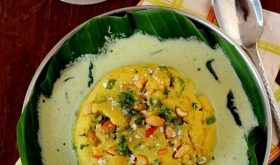 It can be served as a starter or a side with roti, either way it makes for a comforting stir fry. Not only is it filling but light on the stomach. Do not over cook the mushrooms, lightly saute them till soft. And you’d want to cook them just before serving as the dish tastes best, hot off the stove. 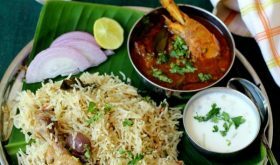 Coriander leaves make for a great garnish. And I must tell you that this stir fry is addictive. Antioxident rich mushrooms are low fat, gluten free and full of nutrition. 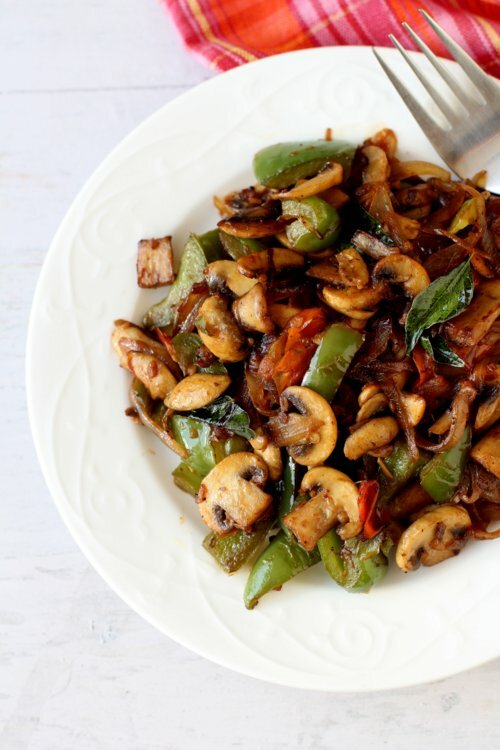 Mushrooms cook very quickly, absorb flavors wonderfully and its meaty texture makes it a great vegetarian alternative to meat. Clean mushrooms of all its dirt and trim the stems. Place them in salted boiling water for a mt. Strain and pat dry with a clean towel. 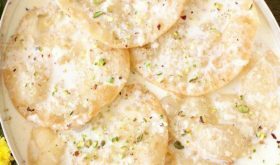 Slice them and set aside. Add oil in a wok or heavy bottomed vessel. Once hot, add garlic and saute for a few secs. Do not burn them. Add the sliced onions, minced ginger, green chilli and curry leaves and saute for 3 mts. Add the capsicum pieces and saute on medium high for 4-5 mts, tossing constantly so that they do not burn. Add the sliced mushrooms, place lid and cook on medium flame until soft and cooked. Stir once in a while. If there is any liquid, cook till the liquid is absorbed. Increase flame and toss the mushrooms so that they do not burn. Add black pepper powder and salt and mix. Turn off flame, add lemon juice and mix. Remove to a serving bowl and garnish with fresh coriander leaves and serve warm. You can add a tomato at the time of sauteing mushrooms. If using tomato, omit lemon juice. 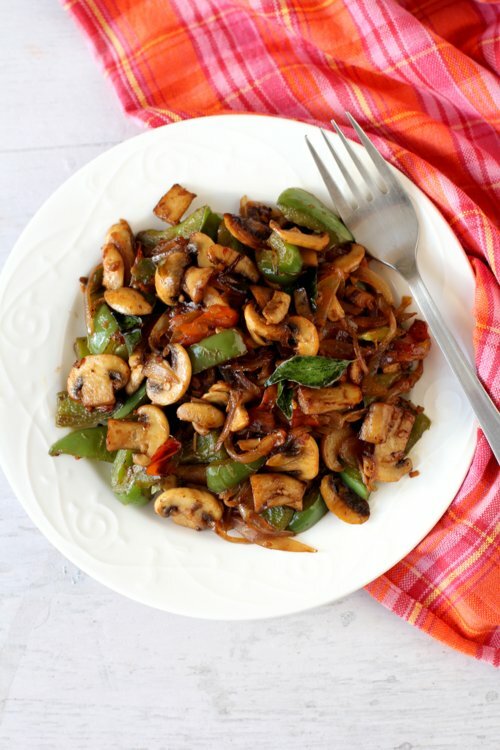 By Sailu Published: March 12, 2015 mushroom pepper fry is a party appetizer or restaurant style stir fry. 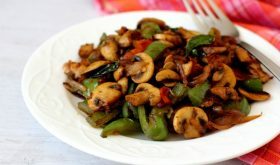 learn how to make mushroom pepper fry with capsicum, mushrooms and black peppercorns. At Step 5, after the flame is turned off. if i am adding tomato instead of lemon juice then how many tomato should be added ? or which one would make the receipe more delicious lemon juice or tomato ? Add 1 large tomato, de-seed and slice. If tomatoes are tart, it lends a nice tang to the dish. Both are equally delicious. NOT REQUIRED TO REMOVE THE BLACK ONES OF MUSH ROOM,CAN WE EAT.. I DO REMOVE, AND REMOVING IS TIRESOME..PLEASE SUGGEST..